A sound understanding of the structure and function of the human body in all of its intricacies is the foundation of a complete medical education. This classic work -- now enhanced with many new and improved drawings -- makes the task of mastering this vast body of information easier and less daunting with its many user-friendly features: - Hundreds of outstanding full-color illustrations - Clear organization according to anatomical system - Abundant clinical tips - Side-by-side images and explanatory text - Helpful color-coding and consistent formatting throughout - Durable, compact design, fits in your pocket - Useful references and suggestions for further reading Emphasizing clinical anatomy, the text integrates current information from an array of medical disciplines into the discussion of the inner organs, including: - Cross-sectional anatomy as a basis for working with modern imaging modalities - Detailed explanations of organ topography and function - Physiological and biochemical information included where appropriate - An entire chapter devoted to pregnancy and human development New Feature: A scratch-off code provides access to WinkingSkull.com PLUS, an interactive online study aid, featuring 600+ full-color anatomy illustrations and radiographs, "labels-on, labels-off" functionality, and timed self-tests. Volume 2 Contents Overview: Cardiovascular System, Respiratory System, Alimentary System, Urinary System, Male Genital System, Female Genital System, Pregnancy and Human Development, Endocrine System, Blood and Lymphatic Systems, Integument. 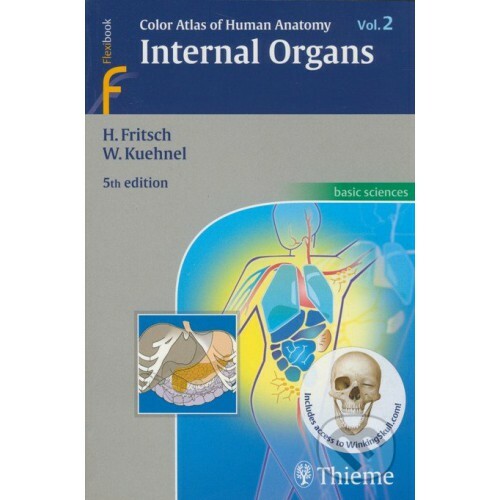 Volume 2: Internal Organs and its companions Volume 1: Locomotor System and Volume 3: Nervous System and Sensory Organs comprise a must-have resource for students of medicine, dentistry, and all allied health fields.